Jean-Philippe Renoult (b.1963) is a sound artist, radio producer, writer and music journalist based in Paris. 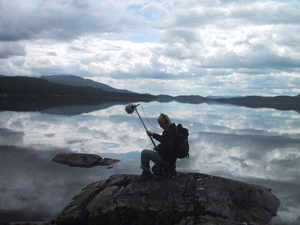 His work focuses on field recordings and electroacoustical transformation of environmental sounds. Recent commissions and collaborations include “I could never make that Music Again”, for the Radiodays Festival, De Appel Gallery, Amsterdam. The album won "Best Artist" prize at the Qwartz Electronic Music awards 2008. He also curated and presented the “Voir et Entendre (See and Hear)” cycle of conferences at the Pompidou Centre Paris. His audio works have been played on Resonance FM, Kunstradio, France Culture, ABC Classic, the Radia network and have been edited on Deep Wireless 2008 edition, Vibrö 2 (the Broken Tale issue), and Aphasia, Subrosa labels. 14. 12. 2008: "Soundscape Forever - Teil 4" curated by SilenceRadio: "I Took You There"
15. 03. 2009: "Locked In"
07. 11. 2010: "Out of breath"